Today we’re excited to have guest blogger Allison Czarnecki, who writes the wonderful blog Petit Elefant, share her ideas for road trippin’ en famille. Welcome and thank you, Allison! I’ve said it before and I’ll say it again: pack wet wipes. There are any number of wet wipe-able emergencies on a road trip, especially with kids, and one pack of big wet wipes is essential to keeping everyone happy, clean, and moving towards your destination. Assign everyone their own luggage. It might seem obvious, but there’s always the temptation to cram everyone’s gear in one big bag since you’re all on the road and in the car together. Don’t give in to temptation. Give each traveler their own bag, color-coded if need be, to keep their stuff separate from the rest. Pack a cooler with your favorite drinks. Yes, a cooler might slosh around when you take corners too fast, but it’s worth it. Completely worth it. Having cold drinks available at your disposal, for a fraction of the cost at a gas station will save your wallet. Assign a designated spot for trash. A bag, an actual garbage can, whatever it may be, keep your garbage separate from the rest and everyone will be happier. Empty it out at every rest stop to keep the car in tip top shape. Make a road trip playlist or two. Or three. The tunes will give you a soundtrack to your trip and will get you through the less stellar hours of your travel time. Take pictures! I know it sounds cliche but you’ll love seeing the photos after the fact. And later, when you look back at the photos you’ll have a visual reminder of the time your kids ran into the ocean fully clothed upon seeing it for the first time. Worth it. Pack light. I had a tendency when we first started traveling as a family to pack everything I could fit in the car. I literally would have taken the kitchen sink if I’d thought it would fit. It’s not worth it. You can do laundry on the road, and it’s pretty likely you’ll be traveling within the walls of civilization. If need be, you can buy what you’re missing once you get where you’re going. You’ll thank me later. Pack healthy snacks. I know, I know, it’s boring not to eat nasty food while you’re on the road but you’ll regret it later. There’s nothing like a frozen slushy drink and some chips to make you feel like summer, but you won’t feel so happy two hours after the fact. Take healthy things you won’t be able to find at a gas station. You can always buy chips on the road but bananas are $3 each at the Gas n’ Sip. Take games! U-NO is fun for everyone and can be played anywhere, even the car. Remember to have fun. Embrace the unexpected. Roll with it, and have the time of your life. There’s nothing quite like a road trip in the summer so enjoy it! 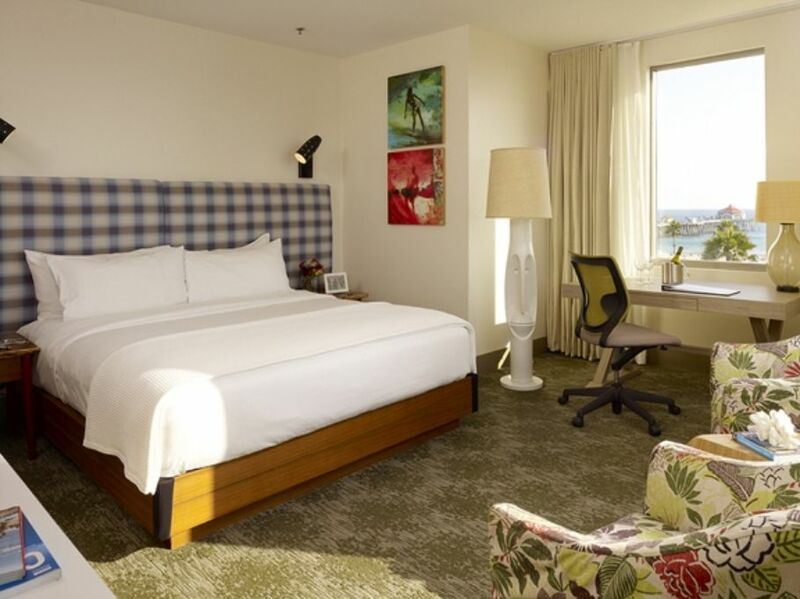 Great post on one of our newest properties, Shorebreak Hotel in Huntington Beach, on Allison Czarnecki’s scrumptious-as-a-stack-of-pancakes blog, Petite Elefant. 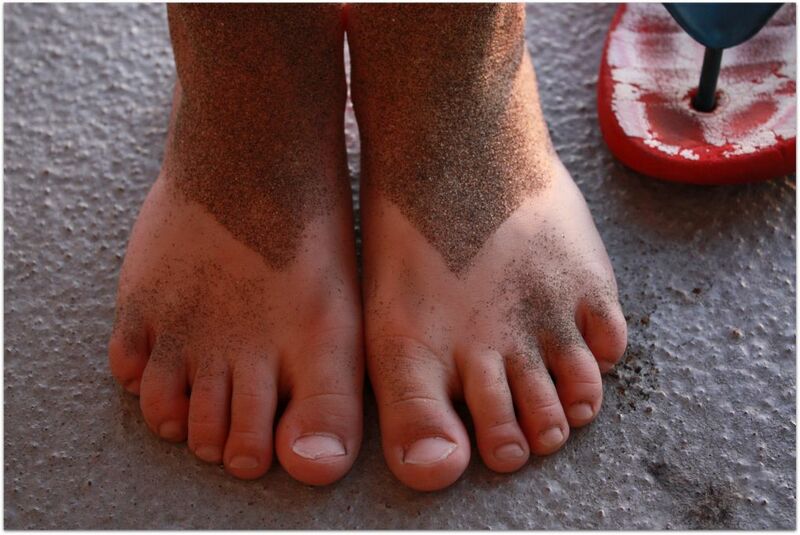 The sandy feet of Allison’s five-year-old are pictured above and, really, need no words. We’re glad the Czarnecki family had a great beachy getaway at Shorebreak and hope Allison’s husband’s “pro” list for moving to SoCal wins out! Among the things nobody tells you before you have kids: traveling with them requires more than a little advance planning. A lot more. And not just for their comfort, mind you, but for your very sanity.